The Belmont-Cragin United community organization hosted Ald. 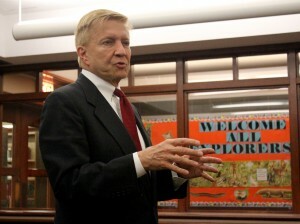 Bob Fioretti Monday night. Held at the Chicago Public Library’s Portage-Cragin Branch, 5108 W. Belmont Ave., the meeting was aimed at letting residents ask the mayoral candidate questions. There were two fatal shootings in Belmont Cragin over weekend and because of this, Fioretti discussed his plans to address the city’s violent crime if elected. To this end the alderman proposes doubling down on job programs for residents in low-income neighborhoods and reopening six of Chicago’s 12 mental health clinics that were closed in 2012. Regarding employment, Deborah Robinson was concerned with Fioretti’s desire to raise the city’s minimum wage by 2018. The alderman is one of 21 Chicago City Council members co-sponsoring an ordinance to raise it to $15 an hour. Robinson was worried the increased income revenue would end up benefiting the suburbs people commute from to work in the city and not Chicago itself. Fioretti plans to make sure the higher minimum wage revenue is reinvested in Chicago communities via a 1 percent commuter tax on the over 600,000 people who live in the suburbs and work in Chicago. He said it would not only guarantee the money stays in Chicago but would add incentive for workers to relocate to the city. The alderman expects this tax to generate about $350 million. The alderman also wants to create a financial transaction tax and supports a change the state’s 5 percent flat tax of a person’s net income into a graduated tax on net income. The change would mean people with less money would pay lower rates while people with more money would pay higher rates. A constitutional amendment would be needed to change the income tax rate. Essentially, both chambers of the general assembly would need to approve the legislation by a three-fifths majority to put a referendum on the ballot. Fioretti also criticized Mayor Rahm Emanuel’s focus on generating tax revenue via red light and speeding cameras across the city instead of using accident data to increase the safety of those streets for residents using things like speed humps.